I love using clams, though the meat in each shell may be so small they do give a lot of flavours to every dish that it is a part of, flavours you cannot get from other seafood. Too bad this lovely sea shells are seasonal in New Zealand so I can’t have them whenever I have cravings for it as they come so expensive, but now it started showing up again in Asian Markets so it’s a good time to get some. It packs a lot of iron even beef steaks and liver is beyond comparison. To illustrate an 80 grams of clams has about 24 milligrams of iron which is more than the RDA of most adults. Clams are a good source of lean protein, there are 20 grams of protein and less than two grams of fat in an 80 grams of clams, that’s nealry the same quality of protiens you get from chicken. Clams are also a good source of phosphorus which is good for proper formation of bones and teeth. Clams contain a very good amount of potassium which helps the body in maintaining blood pressure and regulating heart function. Clams are also rich in vitamin A, which is the the body needs to aid in maintaining a healthy skin and vision. It also contains zinc, copper, manganese and selenium. These are good benefits that you can get from clams but I only know several recipes for this wonderful ingredient that is why when I buy these the end result will only rotate on Clams in White Wine, Spaghetti with Clams, Clam Chowder and this recipe which is one of my Asian inspired freestyle creation, so to add more recipes in that measly collection can you share them to me? I would love to try them out. Add tomatoes and stir fry for 2 minutes. Turn heat to high then add clams, water and oyster sauce, cover and simmer while mixing occasionally in high heat until water is reduced into a thick consistency. Add sesame oil and spring onions then season with salt and freshly ground black pepper. I never buy clams exactly because there is such a tiny amount of “meat” in each shell… I cook very often mussels (the blueish ones) with white wine. I hope the mussels are as healthy as the clams. Thanks for sharing the health information! Love your tips as always, and what a great recipe too. I love clams with tomatoes. Great recipe. Although I can’t and don’t eat clams- you made them look delicious! I’ve never had clams before- but perhaps if I feel brave I’ll tackle this one! Maybe I should let someone else make them the first time though, now that I think of it haha- first a restaurant, then this recipe! Love the idea of clam stir fry. I don’t eat clams, but you’re sure making them look pretty darn delicious. Awesome photo! 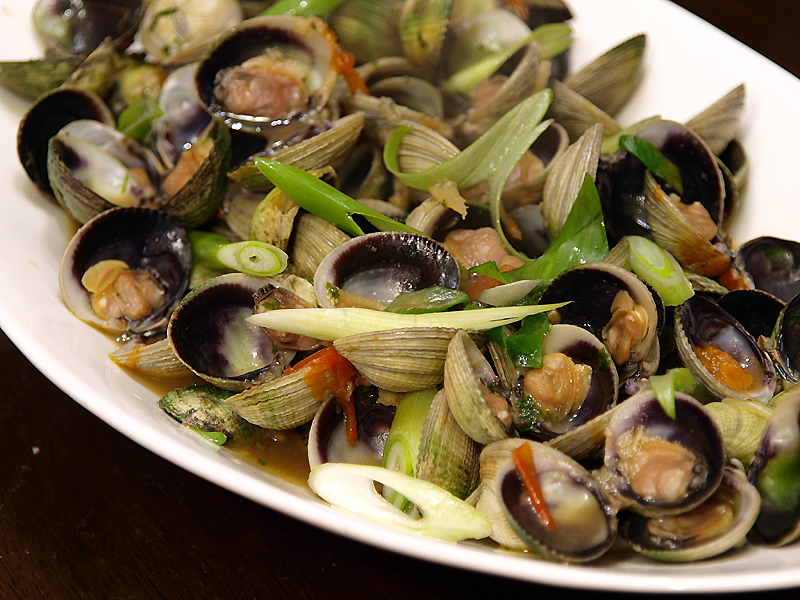 The photo of your clam recipe looks just like the best memories I have of Taiwan’s street food. I can imagine just a bowl of hot rice and the clam recipe with the tasty sauce. Definitely will try your recipe but I am going to try adding basil as well. I have not tried this type of clams except for the flat ones we call “lala”. Your clam recipe is surely appetizing enough. You listed the four clam dishes that I know! And with those four winners, why would you want any more ? Although I;m going to come back to see if anyone else shares their ideas with you 🙂 Great recipe and pic ! Great comments about the nutritional value of clams, was not aware of several of them. I enjoy eating clams and now have more reason to do so! Your recipe is great: worth trying soon.